Is publicizing my Grange really that important? The answer is a thousand times YES! From articles in the newspaper with your Grange Name in the headlines to a letter to the editor, through online and social media sources, or even as simple as face-to-face and word-of-mouth communications, publicity comes in a variety of different forms. But what are the benefits received from positive publicity? Publicity is free. Most newspapers, magazines and websites do not charge to print articles and news releases. It takes very little effort to provide the media with your information. Publicity is by far the most economical way to reach local audiences. Publicity has staying power. When you’re Grange has an article printed in a publication or on a website, your Grange name stays in the public eye as the article is often shared with others. Increases Visibility. As the old saying goes: no one hears the tree that falls in an empty forest. Well, the same could be said for a Grange that no one has ever heard of. Positive publicity generates interest in your Grange. The more your Grange name is in print or on the web, the more your Grange will become a household name on the tips of everyone’s tongues. Enhances Credibility. Your Grange needs to operate at peak performance and become a well-oiled machine, at least in the eyes of the public. The public is diverse in their assessments. Positive publicity creates the perception that your Grange is active and “on the move.” When your Grange is in the news, it becomes a viable, credible and trusted organization. Positive publicity increases the general awareness of your Grange and brings attention to your Grange’s activities, events, programs and projects. If public relations and positive publicity are not a part of your Grange’s marketing, it may be time to consider taking the steps to implement a strategy and reap the benefits. The CT State Grange Public Relations Committee is here to help. 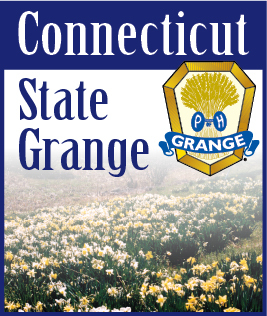 Contact Terri or Bob today at information@ctstategrange.org or publicrelations@ctstategrange.org.